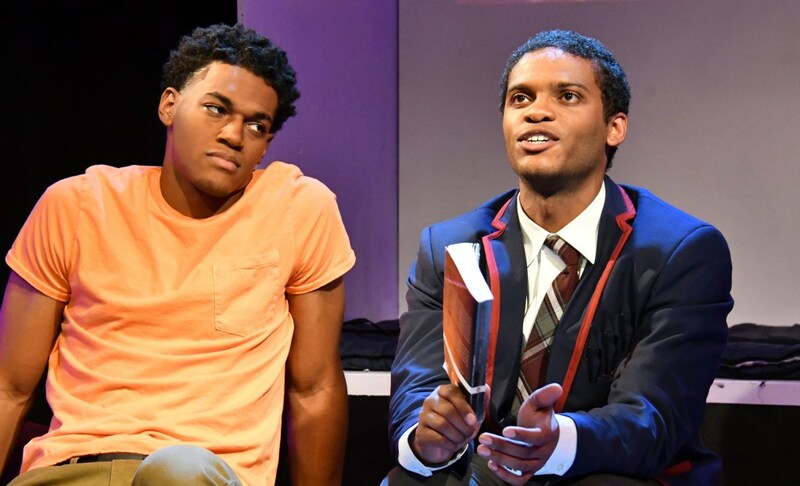 (l to r) Tre’vonne Bell as Tru and Jesse Franklin Charles Vaughn as Marquis in “Hooded, or Being Black for Dummies”by Tearrance Arvelle Chisholm. In “Hooded or Being Black for Dummies,” playwright Tearrance Arvelle Chisholm does not hesitate to directly address stereotypes in ways that might easily offend, provoke uncomfortable laughter, or confused silence. But audiences need not fear, as Chisholm makes it easy to understand how to respond. Before the action of the play begins, a helpful cop (played with insight and wit by BE Rivers, whose own father, the program informs us, was a New York police detective) explains that we are provided with laugh lights, as one might find in a TV studio, so we will know when it is and isn’t okay to laugh. What follows immediately is the image of a young Black man in a hoodie, lying on the ground as if dead, with candy and a soda spilled next to him. Another young Black man asks “What the hell are you doing?” The reply: “I’m Trayvonning, you know, like planking.” Is this a joke about the death of Travon Martin? Are we supposed to laugh? Helpfully, the laugh sign begins to blink and we know how to respond–or do we? Chisholm is determined to make us think it through. The premise of the play is that young Marquis is a Black teenager attending an exclusive prep school where he is the only Black student. He has managed to fit in well, wearing a preppy jacket and a school tie (when he’s not “Travonning”) and running the school’s Young Republican Club. Marquis’s life is turned upside down when he and two of his white friends are caught trespassing in a cemetery (just fooling around) and he is arrested while his friends run away. In a holding cell, waiting for his mother to pick him up, he meets Tru, another Black teenager who, although obviously smart, is the antithesis of preppy, raised in the inner city. The two become friends and eventually Marquis’s busybody stereotypical white liberal Mom arranges for Tru to attend the prep school on scholarship. “Being Black for Dummies” is the instruction manual that Tru writes to instruct his new friend on how to be a real Black man. The premise and the stereotypes are obvious, and the play would be little more than a simplistic situation comedy, if Chisholm didn’t wisely pull away from the stereotypes, and remind us of the very real risks of being a Black teenager in America. But the stereotypes lead to many funny jokes and situations along the way, expertly performed by very young actors Tre’Vonne Bell as Tru, and Jesse Vaughn as Marquis. Their performances are funny, and marked by obvious sincerity and commitment to the material. Peter Alexander is a hoot as a white preppy classmate, Hunter, who accidentally comes into possession of Tru’s instruction book intended for Marquis, with hilarious and disturbing results. Several fine young actors do well as various classmates, and Jessica Risco is very funny as Marquis’s overly engaged adoptive Mom. “Hooded, Or Being Black for Dummies” is funny and thoughtful entertainment, and manages to directly engage issues of race and justice without being didactic, patronizing, or offensive. “Hooded or Being Black for Dummies” continues an extended run at Custommade Theatre Company through April 7. For further information, click here. “Hooded, or Being Black for Dummies” by Tearrance Arvelle Chisholm, produced by the Custom Made Theatre Company. Director: Lisa Marie Rollins. Costumes: Maggie Whitaker. Lights: Maxx Kurzunski. Scenic: Celeste Martore.Sound: Chris Saucedo. Props: Stephanie Dittbern. Projecdtions: Sarah Phykitt. Fight Choreography: Jon Bailey. Tru: Tre’Vonne Bell. Marquis: Jesse Franklin Charles Vaughn. Hunter: Peter Alexander; Prairie: Delaney Corbitt. Clementine: Rebecca Hodges. Meadow: Ari Lagomarsino. Debra: Jessica Risco. Barzol: BE Rivers. Fielder: Max Seijas. Posted in Reviews.Tagged BE Rivers, Charles Kruger, Custommade Theater Company, Hooded or Being Black for Dummies, JesseFranklin Charles Vaughn, Jessica Risco, Peter Alexander, San Francisco bay area theater reviews, Tearrance Arvelle chisholm Tre'Vonne Bell.